What size are betta fish when they’re small? 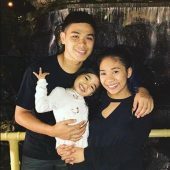 How fast/slow should you expect betta fish to grow? What’s betta fish max size? What do betta fish eat in the wild? What foods are recommended for betta fish? Is a Betta Fish Right For You? Betta fish, also known as Siamese fighting fish, are a hardy species of fish that are incredibly easy to care for. These fish have a lifespan that surpasses that of other common pet fish, with many individuals living well over three years. They are one of the most popular species of pet fish in the world. These fish are known for their jewel-tone hues and spectacular, elegant fins. They come in a variety of morphs, including the Plakat, Crowntail, Halfmoon, and Double Tail. Veiltail is arguably the most popular form of betta fish. While you will need to familiarize yourself with the basics of how to take care of a betta fish, these are arguably one of the easiest fish species of them all to care for. Betta fish originated in Thailand, Vietnam, and Cambodia. Males come in a variety of colors and are interesting to watch, making them a good choice for a first-time pet owner. These fish get their name from their somewhat aggressive behavior when housed with other fish, particularly tropical fish with large fins and other bettas, so it’s important to provide them with a mostly isolated environment. Knowing these details asb well as others related to betta care is important, because it’s what will help your fish thrive instead of just survive. You should familiarize yourself with every aspect of caring for one of these magnificent species long before you pick one up from the pet store. Most people acquire bettas when they are babies, with the first few weeks of life being the most important for these young individuals. Baby bettas will usually be about an inch in length or less, making them easy to feed and care for. That being said, most people purchase bettas from pet stores when they are somewhere between six months and a year in age. They are often already adults at this point. However, some pet stores now sell baby betta fish (or fry) that range from five weeks to nine weeks in age, giving you the opportunity to care for your fish throughout all of their life stages. Betta fish are considered fully grown adults when they reach the age of seven months. They can often grow much larger past this point depending on their environment, feed, and care. Adult male and female betta fish vary in size because you must take finnage into account. Males have substantially larger fins than females, but their bodies remain about the same size. Females tend to be a bit thinner. 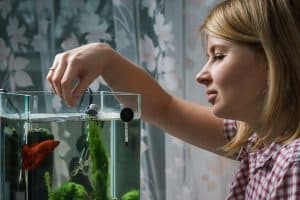 Caring for betta fish is not terribly challenging, but you should keep in mind that these fish can grow quite large – with some varieties growing up to three inches in length. Therefore, you will need a relatively large tank. Betta fish can grow up to three inches in length, with non-commercial varieties growing up to five inches in length under ideal circumstances. In the wild, betta fish eat a number of diverse foods. They stick primarily to proteins, and do not eat plant roots, as is a frequent misconception. Bettas are insectivores, so their diet in captivity should also be composed of protein-based foods. A diverse diet is highly recommended for betta fish. They need protein-rich foods that will help them increase in size. As carnivores, bettas should consume a mixture of protein-rich pellets and freeze-dried bloodworms or brine shrimp. Live foods are also an option, but you should consult with your local veterinarian or pet store owners before making this switch, as live foods can carry disease. That being said, during some stages of life (such as breeding and hatching periods, as well as the fry stage), a betta fish will actually need live food in order to survive and reproduce. I highly recommend Hikari Betta Bio-Gold, it contains a balanced diet for all types of bettas and has been developed after years of research and recipes. Make sure to only feed your betta as much as it can eat in two minutes, as a betta’s stomach is only about as large as the size of its eyeball. 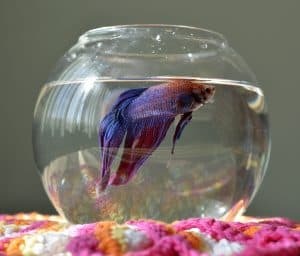 It is more common for betta to die from overfeeding than from starvation. You can feed insects or worms to your betta either live or dead, but if you feed live food, make sure you rinse it off first. Live food can also hide in the gravel of a fish tank, so if you use pebbles or gravel, avoid live foods as they can hide in the gravel for long periods of time. Betta fish hail from the tropical waters of Thailand, tending to stay in the shallows. They prefer waters that are clean, warm, and move slowly, so can often be found in the area’s rice paddies or similar areas. Bettas rise naturally to the surface to breathe, as they are one of the few species of fish that have the ability to breathe oxygen from the water’s surface. Therefore, when you fill your tank, you should make sure you leave a small space at the top of the tank for the fish to breathe. Bettas need a five-gallon or larger tank, aquarium or bowl. While they can live in tank sizes as small as a single gallon, this is not recommended, especially if you plan on housing more than one fish. You should keep a betta fish in a five to ten gallon tank, ideally one that is of high-quality materials and composition. Betta fish have the reputation of being aggressive fish, but this is often caused by improper tank set up. Up to five females can be kept together as long as they have enough room. While you can’t keep two males together, or place your male betta with other aggressive fish like cichlids, any other housing system can be maintained with relative harmony. Just make sure your fish have plenty of room to swim around in the tank without worrying about injury, illness, or fighting. While betta fish don’t necessarily need a water filter or aerator, since they are a labyrinth species, adding these two pieces of equipment does not hurt. You also need to make sure you clean your betta’s tank regularly. Your tank should be filled with bottled, filtered water, or with water that is marketed specifically for bettas. Do not use tap water, as this can damage your betta’s health due to trace elements such as chlorine and chloramine. Betta fish are highly sensitive to fluctuating water conditions. You will need to acclimate your betta by putting it in a separate container with half the new water and half the water it came in from the pet store. Let it stand for about half an hour, and then gradually introduce your fish to its new home. You should change the water in your betta’s tank in twenty-five percent portions, doing so about once a week. A filtration unit cna help reduce the frequency in which you need to do this. You also need to include a heater for tanks larger than a gallon in size. Five watts of power per gallon of water is an adequate amount of heat. Make sure you also include a lid on your tank, as betta fish are excellent jumpers and can hop right out if tempted. Betta fish don’t necessarily need decorations for entertainment or hiding, but decorations can help spruce up your betta’s environment and also provide a fun activity for your fish. Betta fish, especially females, enjoy darting behind hiding spots, so decorations are a great addition for this species. Floating driftwood pieces, plants, or pebbles are a great way to adorn your fish’s new home. Just make sure they are well-rinsed and removed of any impurities or debris. Try to use live plants instead of article (you can alternatively use decorations made specifically for betta), since these fish have delicate fins that can easily be damaged by hard plastic decor. Set these up first, before you add any filter equipment or water. There are several fish which can safely live with bettas of either gender. Avoid fish like goldfish, as bettas are tropical fish and will not do well in the colder waters needed by goldfish. The foods required by both species also vary drastically, so housing these two species together can cause you to poison one or the other. Betta fish also do not make good tank mates with tropical, large, or colorful fish in general. Betta have the unfortunate reputation of being aggressive toward other fish. This is true in some respects. For example, male betta fish should not be housed with each other, as they will likely kill each other. You can sometimes keep two or more female betta fish together, but females have also been known to kill each other and should only be housed in very large tanks with each other. Bettas tend to be rather resilient fish, but there are several signs of disease that should be watched for. For example, if you notice that your fish has decreased appetite, damaged fins (including those that are clamped to its sides), abdominal swelling, or inflamed or discolored scales, you should seek medical treatment immediately. Fin rot is one of the most common betta health issues. This is evident in the form of frayed or reddened fins and is caused by poor water quality. Betta can also develop fungal growths on their scales, which is usually accompanied by eye discoloration.This fungus is caused by exposure to other contaminated fish, so quarantining the affected individuals can help. Bacterial infections and ich are also common, both of which appear as discoloration and other symptoms like rapid respirations and cloudy eyes. Again, quarantine and improving water quality tend to be the two best treatments for these diseases as well. Interestingly, betta fish are also prone to constipation. You can prevent this by feeding them one cooked pea without its shell about once a week. Once you do this, do not feed the betta the next day. This will help clear the digestive tract. A healthy fish will be active and alert, consuming food regularly and reacting aggressively only to new or outside stimulus. To keep your fish healthy, avoid overcrowding and make sure you change your water regularly. Proper betta care will lead to minimal health problems in the long run. A good way to keep your betta fish healthy is to add a filtration unit. You might think that changing your water regularly will keep your betta fish healthy, but this is imply not the case, as you can’t catch all impurities. Many diseases are caused by poor water conditions. Breeding betta fish is an enjoyable hobby, but you should make sure you educate yourself thoroughly on the details involved before beginning to do this. Over six hundred eggs can come from a single spawn, meaning you could end up caring for several hundred fish if you’re not careful! Bettas breed best when they are young, so try to find a reputable breeder and don’t instead rely on pet store bettas – these are often too old to breed. A breeding tank should be tween five and ten gallons and equipped with a removable divider. When you’re ready to breed, you should only feed live food, as betta fry will only eat live food for several weeks. Once your tank and food is ready, introduce the breeding pair. You can gradually acclimate themselves to each other before putting them in the same section of the tank. This helps to reduce injury and increase the likelihood of breeding. Courtship can last for several days, but make sure there are plenty of spots for the female to hide to escape the male, as he can be aggressive. The female will gradually release eggs after the mating has happened. Once the eggs are released and the male has moved them to his nest, you need to move the female back out of the tank to avoid the male’s aggression. Once the eggs have hatched and the fry can swim around, remove the male to prevent the risk of the male eating the fry. Bettas are unique in that they are a rare type of fish, known as a labyrinth fish, that has the ability to absorb oxygen from the air as well as through their gills. This is part of what makes betta fish so hardy – they can tolerate poor water quality better than other species. It’s no secret that male betta fish are aggressive, and will attack other males without cause. However, an interesting fact about these fish is that they will actually flare their fins out when threatened or disturbed. If you’re unsure of whether your betta fish and other fish are cohabitating well, watch for these signs of aggression, as they can be early indicators of how well the arrangement is working. If you’re considering buying a betta fish, you’re in luck. These fish are fun, fascinating, and absolutely beautiful. Owning a betta fish is a rewarding experience that you will remember for the rest of your life. that being said, there is some skill and attention required for proper betta fish care. Consider why you want fish, and whether they are a good pet for you. Betta fish are less expensive than other types of pets, but there are costs involved that you must take into consideration. Similarly, there is substantial time involved for caring for your bettas (think feeding, breeding, cleaning the tank, and changing out the water). It’s important that you are aware of these considerations before you decide to purchase one or more betta fish. On that same note, if you already have an aquarium, you need to consider whether your new betta fish addition will live peacefully with your other fish. Ask yourself these questions and research the specific needs of betta fish before jumping into this commitment. While they are a less expensive and time-consuming pet, they do demand a significant amount of dedication. However, these beautiful fish are worthy of consideration, as they will brighten up your aquarium, your home, and, of course, your day.